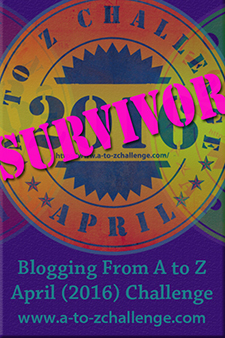 This was my third consecutive year of signing up for the A to Z challenge. It was really tough the previous two years as well, but somehow I managed to get past it and complete the challenge successfully. I thought it would be the same this year as well. I had my theme planned out by January, but I had no clue what post I would write for each alphabet. Towards the end of March, my work load tripled and I was left with zero time for anything else. By March 31st when others had most of their posts scheduled, I had no idea what I would write the next day for 'A'! I panicked so much that I barely slept that night. I woke up in the morning with the same thought. While I was doing my daily browsing of Twitter, Instagram and Facebook, I saw that a friend of mine had checked in to an airport. And that's when the idea came. None of my posts were scheduled. Every topic was thought of at the last minute (No, I'm not very proud of it) and almost every post was posted at the last minute too. The posts for Saturdays always spilt over to Mondays as weekends were the only time I got some rest. I did not want to touch the laptop then. By the end of the month I had some good quality posts that stuck true to the theme. I chose 'All about me' because I thought it would be simple. Turns out it is really difficult to talk much about yourself. Had I been the narcissist I was a few years ago, it would have been a breeze. But now, I struggled to talk so much about myself everyday. Having said that, I enjoyed writing every single post as much I enjoyed reading the posts of others. Airports was a very personal topic to me. I have been wanting to talk about it for quite sometime but somehow it never materialized. But when it did, I could see so many people relate to it. Blunt had to be written, because that is what I'm known for. Chick Flicks was a light post about a serious topic and I'm still so shocked by the fact that there are a lot of people who think that chick flicks and rom coms are the same thing. Diaper Talks had to be spoken about as this was something I wanted to scream out from the roof tops. I did lose a few friends because of this but I'm not complaining. Engineering is such a waste in my life that it had to be a part of all about me. The only thing good about it was that I got a campus placement and I love my job till date. FRIENDS is a piece of me that will never die. There is no other show that has held this space in my heart till now and I'm sure never will. Generation Gap was something that I wanted to talk about as I see so many people in my own generation act like they belong to the 14th century. Being Home Alone is very important to me and I wanted to share my feelings about it. Indian Mentality and Indians will always be a never ending topic, but Indian behavior on flights completely pisses me off, hence the post. Justification was a post justifying the fact as to why I hate justifying things. I put an end to it once and for all. Keeping In Touch had to be spoken about. People just come in and out of your life and blame you for not bothering about them. Live And Let Live was written for the same reason as well. Motherhood perhaps is the post most close to me as it was everything I had to say about not wanting to be a mother. No was an important post as I only learnt to say that recently and I knew will help others as well. OCD, I had a crazy OCD to write about it. And yes, in a particular order. Poetry, well, just had to be written. Quirky had to be there if I was talking about myself. Hello! Relationships too was a post close to my heart as I have lost quite a few of them. Regrets? No. But learnings, yes. Simplicity had to be spoken about in an era where people use fancy words in day to day life just to appear cool. Trebuchet MS was an extension of my OCD, but it sure deserved a post of its own. Also I couldn't think of anything else for T. Unlearn is what kept me going all these years and Vanity helped me stay off a lot of people and trash the memories I had with them. Woman Vs Woman is something I firmly believe in and I just wanted to throw some light on how women are hell bent upon bringing other women down. Xerox Copy was a post that I wrote in ten minutes flat. Well, what else could I write about for X that was about me or what I thought? You was the most important part of me and also my favorite from the whole A to Z so far. Zero was an advice to people to pick themselves up and do something. At least take one step instead of five. But did it help anyone? I'm not too sure. So A to Z 2016 was one hell of a ride and I was more than glad when it ended. Having said that, will I sign up for it next year? Hell yeah! Cheers to all of us who took part and completed this challenge. We are survivors! See you next year. What a lovely way to sum up your posts here. Your theme was you and I loved reading all of the posts. Good job and congratulations on nailing it the 3rd time. Congratulations! I know that it is an achievement you should be immensely proud about because I am a person who can hardly put up three meaningless posts every month! Awesome way to sum it up! I may not have commented for the entire challenge but have been following up on all of them.